The ChiroThin diet program is an anti-inflammatory, low-glycemic index diet that includes complex carbohydrates and protein. It offers a new approach to weight loss, and we’re happy to offer it to our Superior Healthcare clients. 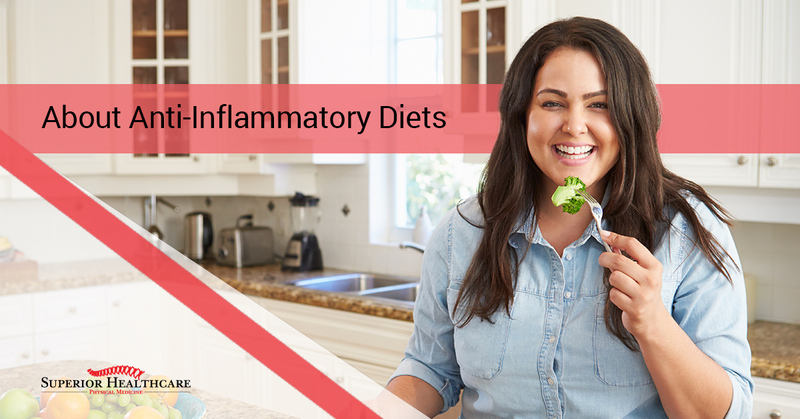 Inflammation is not a dirty word. It occurs naturally when our body’s immune response system kicks in to fight a bacterial infection, virus, or injury. Problems occur when our immune system works against us, attacking healthy tissue, and causing chronic inflammation. In addition to weight gain and difficulty shedding extra pounds, arthritis, peptic ulcers, chronic sinusitis, and other diseases are associated with long-term inflammation. Diet can go a long way in helping to alleviate symptoms. High fiber foods—stick to low-sugar options like green leafy vegetables, cauliflower, celery, beets, onions, garlic, and eggplant. Berries and pineapple make great additions that help keep sweet cravings away and add a lot of nutrients and fiber to your diet. Blueberries are especially good for you. Herbs and spices play a role too. Include things like turmeric and ginger in your recipes. Good fats—Make sure you are getting plenty of omega-3 fatty acids to reduce inflammatory-causing C-reactive and interleukin-6 proteins. Fatty fish is your best bet for getting enough omega 3 into your diet. Nuts and seeds also have a ton of fiber and good fat. Walnuts, pine nuts, and almonds are all great choices. Processed food—Just say no to processed food. They offer little-to-no nutritional value and are full of ingredients that are going to have the opposite effect of all of the good food you’ve been giving your body. They are also full of sodium. Generally, you’ll want to cut way back on salt, and processed foods are probably where you were getting the vast majority of your salt before you started on this healthy path. In our next article, we’ll look at how all of this is connected to weight gain. Meanwhile, if you think the ChiroThin program might be a good fit for you, please call our office and schedule an initial consultation. We’re here to help.